Who would have thought that Tim Burton's quirky Halloween romance would have become such a cult classic that 25 years later not only would we be marking Jack and Sally's silver anniversary but we would be doing it in LEGO style? The Eighties have seen their fair share of LEGO BrickHeadz sets and now it's the turn of the Nineties with today's release of 71630 Jack Skellington & Sally, just ahead of the 25th anniversary of the movie's October 17th release. These LEGO BrickHeadz construction characters featuring Jack Skellington & Sally are fun to build using LEGO bricks that recreate all their iconic details, including Jack’s frightful smile and black pin-striped suit, plus Sally’s decorated eyes and scruffy rag doll look. They also stand on buildable collector's baseplates with BrickHeadz logo for easy display in your home, office or anywhere you like. 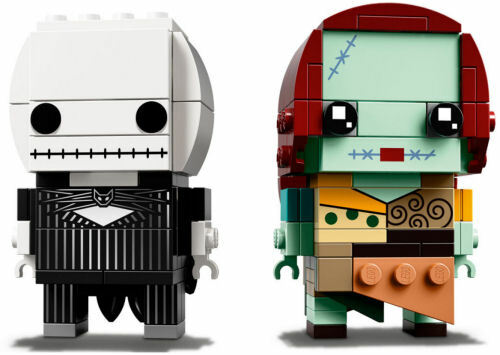 Buildable Jack Skellington and Sally LEGO BrickHeadz construction characters feature authentic details from the original Disney blockbuster, Tim Burton’s The Nightmare Before Christmas movie, including Jack’s creepy mouth and black pin-striped suit, plus Sally's decorated eyes and scruffy rag doll look. Have fun growing your LEGO BrickHeadz collection with other characters from your favorite TV series, games and comics.